This advertisement button was cut out and made from something found at a health centre. 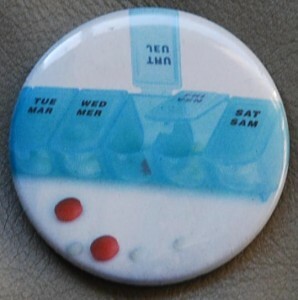 You can make a pills button, or another health button, from materials you see at your next doctors appointment! This entry was posted in Button Makers Canada, Canadian Button Makers and tagged drugs on August 29, 2013 by BadgeMan. You might want to poke a pin in the cheeks of this face pin-back button. I think this is a cute comic button! Can you guess what this advertisement button was originally taken from? This entry was posted in Button Makers Canada, Canadian Button Makers and tagged Button Makers, face on August 14, 2013 by BadgeMan. A music button is usually for a band. But what about the device you listen to the band on? This radio button is radical! This entry was posted in Button Makers Canada, Canadian Button Makers and tagged music on August 14, 2013 by BadgeMan. The Simpsons has been on the air for 24 years! Very few television shows, let alone cartoons, have aired for that long. Television buttons of one of the most popular shows in history. These Simpsons buttons have some funny quotes on them. The longest running cartoon, Sazae-san, is from Japan. What is your favourite cartoon show? This entry was posted in Button Makers Canada, Canadian Button Makers and tagged television on August 7, 2013 by BadgeMan.